FeastHome – Do you prioritize a practicality in your kitchen in order to support your cooking activity? Then, the hanging up pots might be suitable for you. The hanging up pots act like an open cabinet. So that you do not have to open and close the cabinets every time when you need to take out the cooking pots. The hanging up pots are also making it easy for you to find the pots that you need. 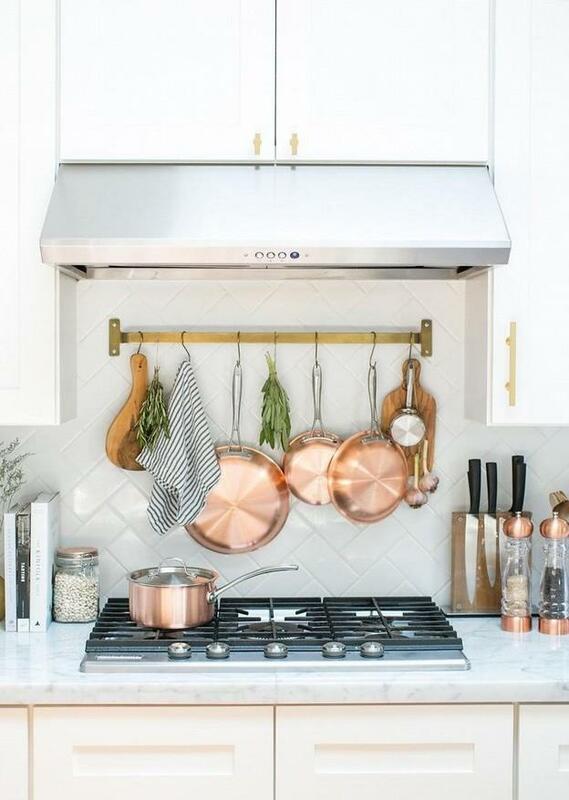 This idea below of how to hang up the cooking pots is perfect for you who adore a simplicity. The cooking pots are hung up on 3 black irons that blend very well with the white tiles kitchen walls. The black iron hangers and the white tiles kitchen walls create a monochrome theme in this kitchen area. This is what makes the kitchen has a simple minimalist look. 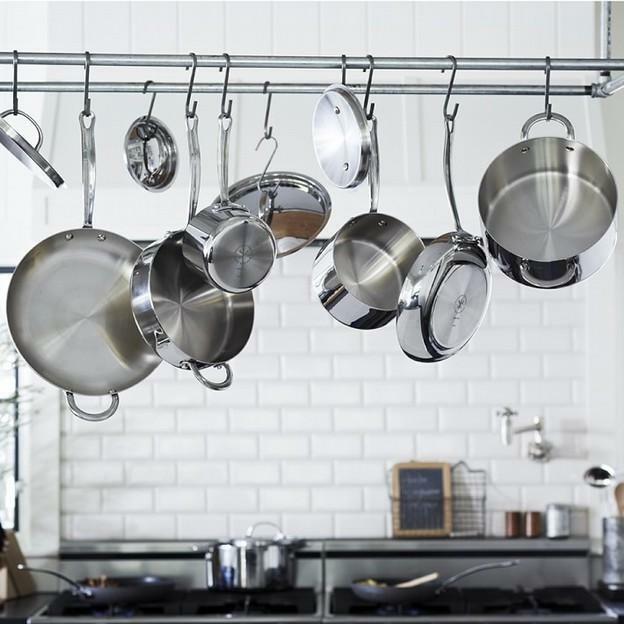 The black iron hangers are matched with the stainless steel kitchen pots and other kitchen utensils made from various materials, such as the wooden cutting board. The flower pots are added to sweeten the minimalist style. 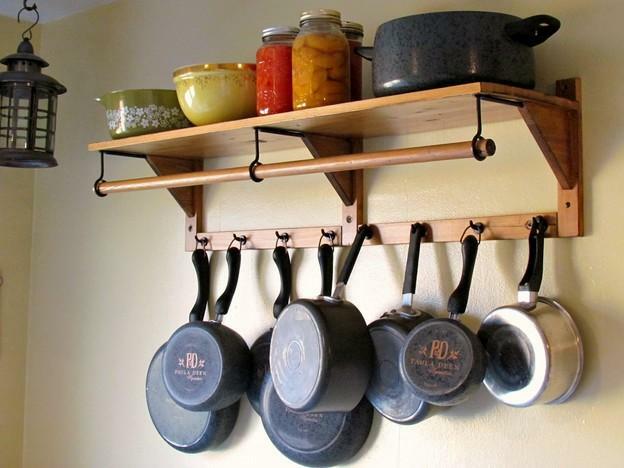 You do not have to always hang up your cooking pots on the kitchen walls. You are also able to hang them up above the kitchen table, just like the picture below. The unique hanger used to hang up the cooking pots brings an industrial look to the kitchen area, but surprisingly it matches with the traditional style that dominates the kitchen. 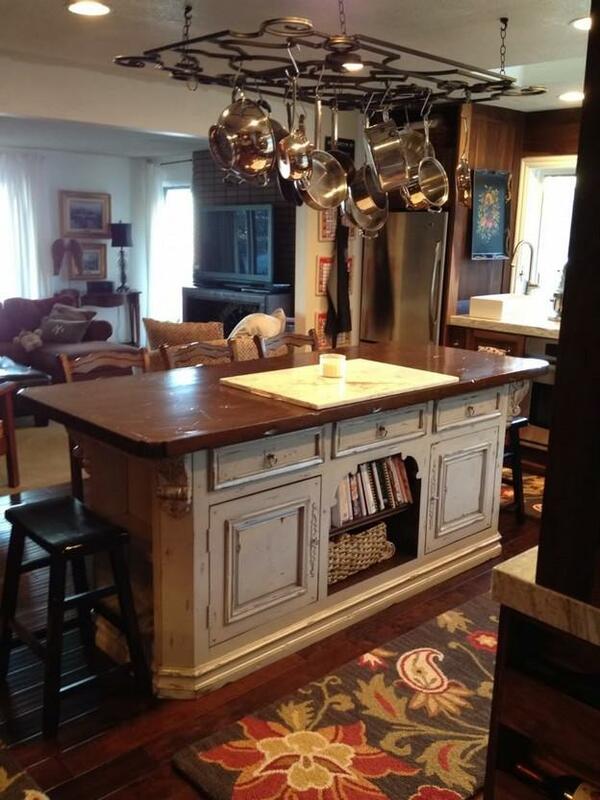 The traditional style looks strong because of the faded white kitchen cabinets, added by the patterned rug. 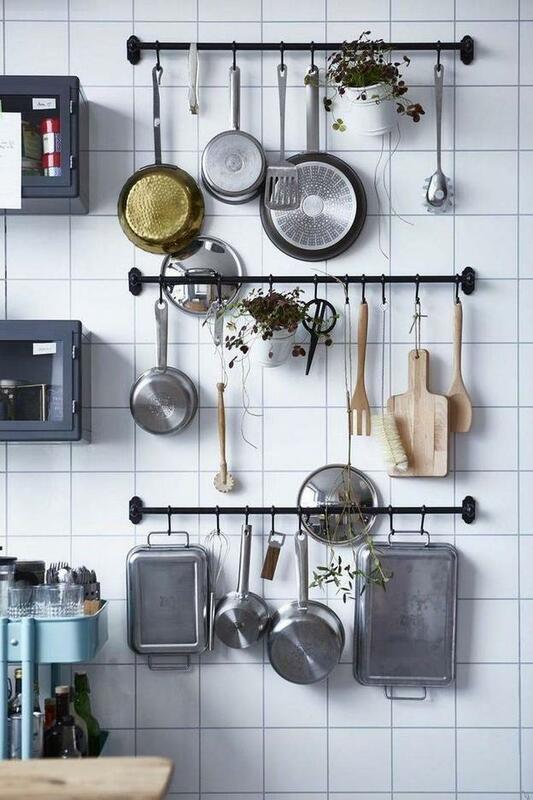 This arrangement is suitable for you if you find it hard to hang up your cooking pots in the kitchen walls. The householders match their stainless steel cooking pots with a stainless steel hanger in order to hang them up. This idea is able to be an alternative for you who want to bring a modern or futuristic touch to your kitchen. You also do not have to complicate yourself by choosing which kind of hanger that is suitable for your stainless steel cooking pots. But it will be better if you play some patterns or colors so that your kitchen area does not look unattractive. The wooden hanger in the image below blends perfectly with the bronze cooking pots and of course, the wooden cutting board. 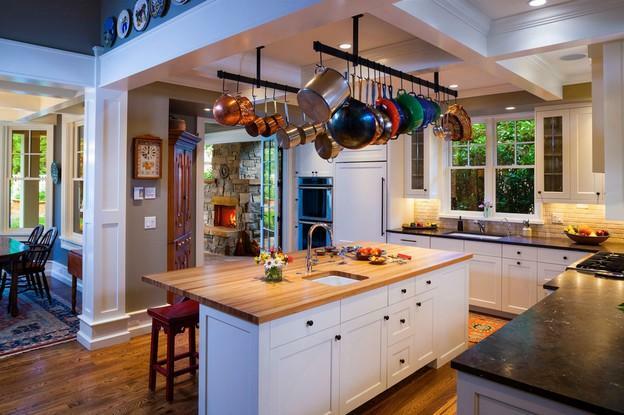 The wooden hanger and bronze cooking pots bring a warm touch to this kitchen area. 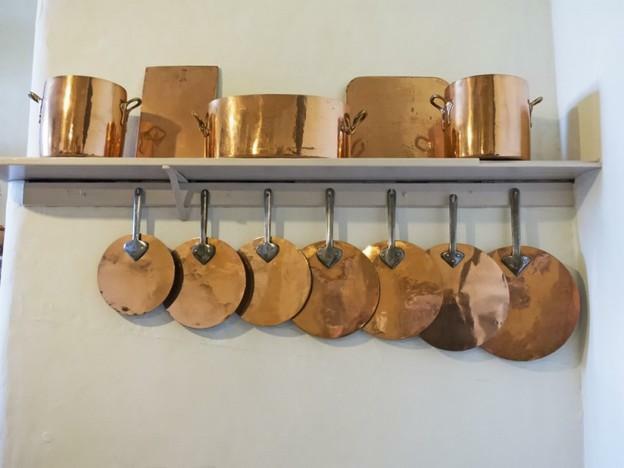 The cooking pots are hung up on the kitchen walls near the stove. This makes it easy for the householders to take out the cooking pot they need when they cook some meals. Moreover, the wooden hanger is also suitable for the minimalist style in the kitchen area. 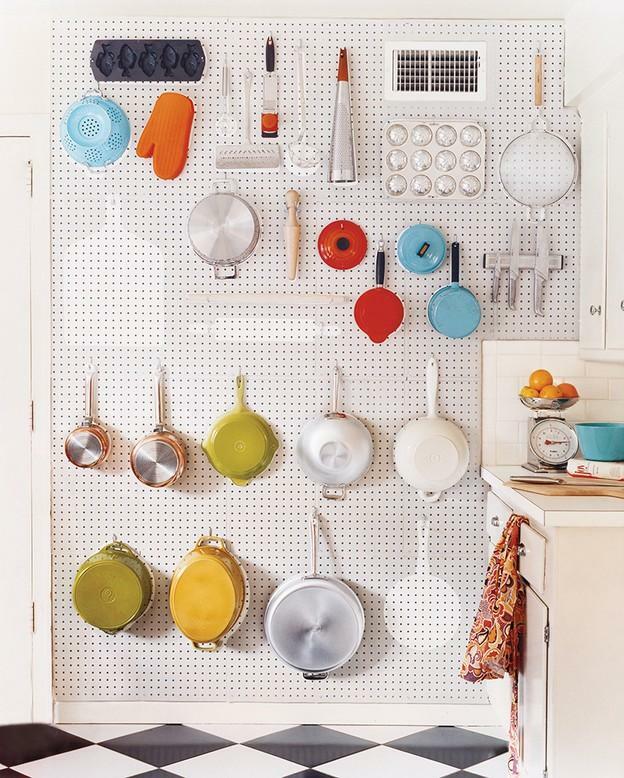 Do you need an additional storage besides a rack or kitchen cabinet to save your kitchen utensils? Then, you can follow this idea below. A hidden hanger is installed below the rack in order to hang up the cooking pots. The hidden rack is in one theme with the rack. The shiny bronze cooking pots match perfectly with the grey rack and hanger. The rack and hanger can be included as a kitchen cabinet which is very practical. It will be easy for you to find the cooking pots that you need. 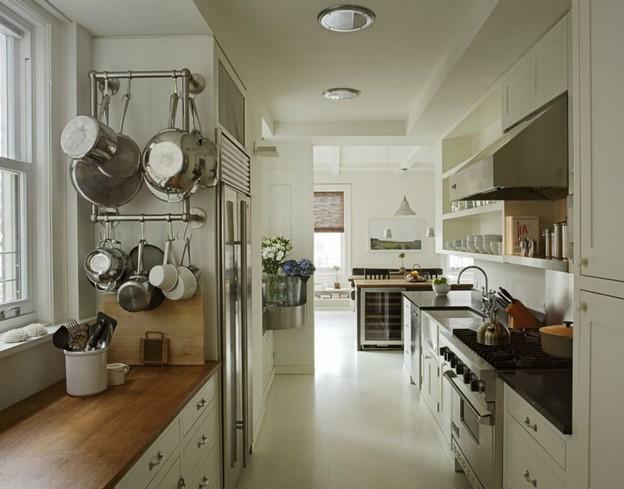 Are you getting bored with the conventional straight hanger as the place to hang up your cooking pots in the kitchen? Do not worry, there are also some shaped hangers, one of them is a square-shaped hanger in the picture below. The stainless steel square hanger matches flawlessly with the stainless steel cooking pots, bringing a simple modern look to the kitchen area. The hanger is also able to provide more spaces than the straight one. For you who have a lot of cooking pots, you can choose this type of hanger. For you who want to have an anti-mainstream hanger to hang up your cooking pots, you can pick a meshed hanger like the image below. The meshed hangers are placed quite high enough from the countertops so that the householders’ heads do not bump with the hung up cooking pots. But it is not too high for the householders to take the cooking pots. If you have toddlers in your house, this type of hanger will make it safe for them. 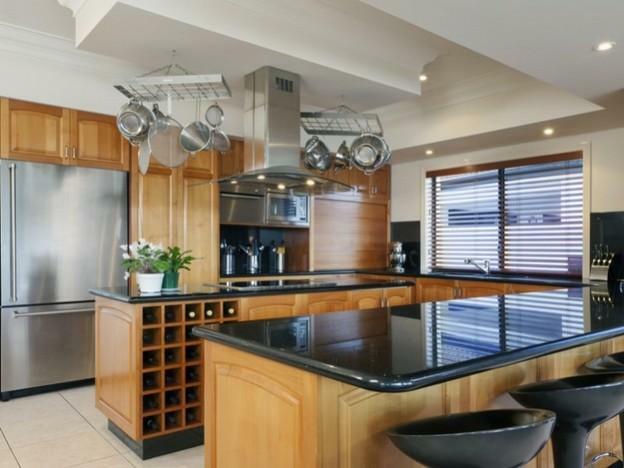 This kitchen has 2 black hangers that are installed on the kitchen ceilings to hang up the cooking pots. Even though the hangers are in a different color with the other colors in the kitchen area, they still match the other kitchen elements. It is because black is a neutral color. Instead, the black hangers add a color to the kitchen area that is dominated by white. The hangers are placed above the sink so that it is easy to put the washed cooking pots there. Are you looking for a super attractive hanger to store your cooking pots? Then, choose a dotted hanger like the image below. Not only able to hang up the cooking pots, but this kind of hanger is also able to hang up other kitchen utensils. Such as a mold, grater, cutting board, and many more. A dotted hanger can also provide a lot of spaces for your kitchen utensils. But you also have to know that this kind of hanger also needs many spaces in your kitchen area. www.pics.designThis type of hanger is very practical because it becomes one with the rack. So that you do not have to separately install the rack and hanger. This practical hanger provides enough spaces to store your kitchen utensils and kitchen pots. Moreover, the natural wood material will add a natural and warm atmosphere to your kitchen. Those are the ideas of the hanging up pots for you who demand a practicality.